This page describe Samba4 Active Directory installation on CentOS 7. The environment is composed by 2 DCs with replication, and one fileserver. The installation is based on CentOS7 Minimal ISO, you should update the system and install basic tools. This pre-setup can be done in all 3 servers, basically it will setup the Sernet Samba Repository and install samba from repo. First of all we need a domain, so lets provision it. You can safely ignore it: Warning: No NC replicated for Connection! This post setup will configure the services to startup and disable Selinux and Firewall, during my tests firewalld did not save the allowed ports, even with permanent flag, so I´v decided to disable to avoid problems. The pre-setup is the same, but we are not going provision neither join, the fileserver will be just a member of domain. CentOS bring us a useful tool to do it, actually we are going to setup authentication and join the domain in one shot. _ldap._tcp.domain.com.br has SRV record 0 100 389 dc1.domain.com.br. Ignore DNS error, you have to create DNS host A manually, at this point you can use windows interface to do that. 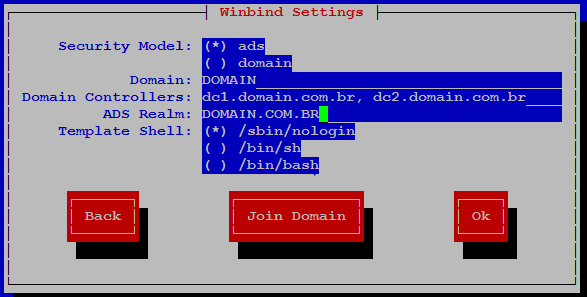 Set ACL to domain admins can change permissions. This page was last modified on 15 December 2015, at 13:32. This page has been accessed 8,141 times.